Columbus Day is coming up, and before your students go and enjoy a nice long weekend off from school, why not teach them about rhyming words in a Columbus Day-themed poetry lesson. This lesson includes several games and activities to teach your students about rhyming. This is also a great time to teach your students a little more about the 50 great states that make up America. Help your students practice rhyming with our new lesson! We have created a great way to help your students with their rhyming skills. 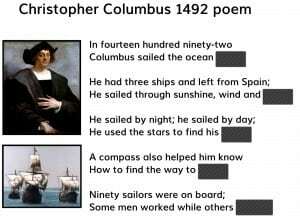 The “Columbus Day Poem” lesson contains 4 activities focused around rhyming and a famous little poem about Christopher Columbus. These activities include a rhyming word dictation tool and a “create your own poem” activity. In honor of Columbus Day, how about teaching your students more about the country that he helped discover. This map can be shown with all of the states, capitals, and main bodies of water labeled or with the names missing. This is perfect for introducing this information to younger students for the first time, or testing the knowledge of older students. Have fun using those interactive Columbus Day activity and lesson on your interactive whiteboard!